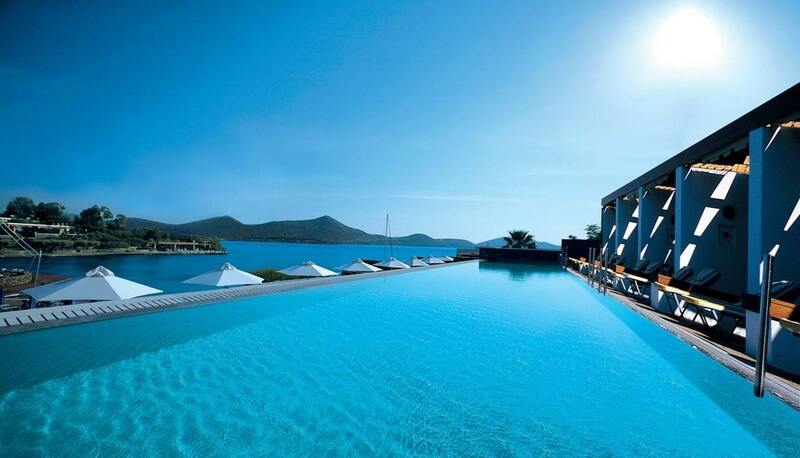 Elounda Bay Palace Hotel is set amongst the historic cultural and naturally varied beauty of northeastern Crete, in Elounda. Its tranquil setting at the edge of Mirabello Bay, a truly blissful place to call home, is surrounded by 20 acres of lush gardens. 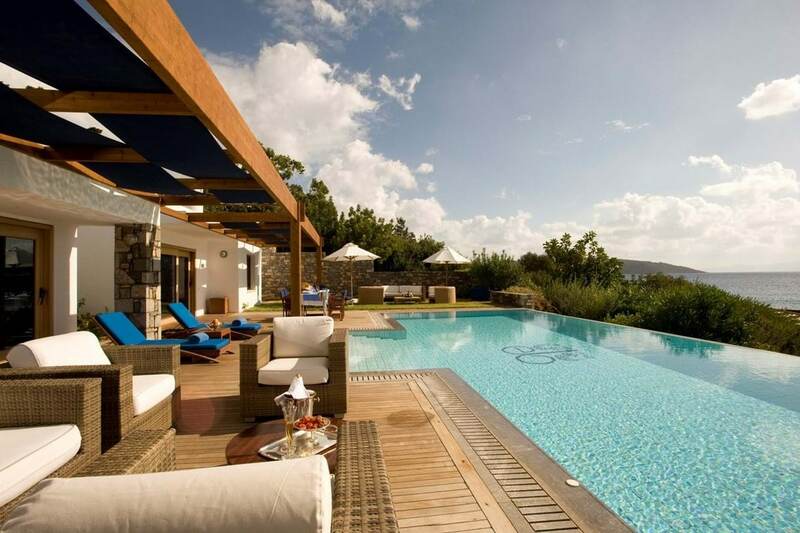 This award winning luxury resort combines Crete's charms, unique hospitality and renowned levels of personalized service that guarantees unparallel holiday rich in leisure and easily found relaxation. The hotel is 65 km from Heraklion Airport. In the prestigious area of Crete, on the first coastline. To the elite village with the best fish taverns - 1.5 km, to Agios Nikolaos (the nightlife center) - 7 km. Sandy beach the lagoon is equipped with everything necessary for comfortable rest. Sheltered from the winds, the entrance to the sea is shallow. Thalassa: This glamorous restaurant is famous for its delicious fish menu and wide selection of other gourmet seafood delicacies. Dining at Thalassa is a romantic and relaxing experience, as the restaurant is set right by the water’s edge overlooking the sparkling bay. Gentle live music accompanies you as you enjoy your evening meal. Cuisine: Modern Healthy Cretan - Seafood Restaurant, Hours of operation Dinner: 19:30 -23:30, Dress Code: Formal to Smart Casual. Ariadne: Ariadne, a classic seaside tavern, is just the thing as you step off the beach in search of a light à la carte lunch of grilled fish, meats, delicious fresh salads and other appetizing regional specialties. Cuisine: Greek Restaurant, Hours of operation Lunch: 12:30 - 18:00, Dress Code: Casual Beachwear. ‘F’ restaurant: An exciting addition to Elounda Bay Palace, the waterfront restaurant “F” specializes in fresh salads, Tappas and light snacks in a casual-chic waterfront setting. Guests can enjoy a refreshing cocktail and beautiful bay views at the Sail-In jetty bar. Cuisine: Fresh salads, Tappas, light snacks, Hours of operation Lunch: 12:30 - 18:00, Dress Code: Casual Beachwear. Aretoussa: The chefs of Aretoussa specialize in carrying on the most beloved traditions of Greek and international cuisine. The restaurant faces out onto a striking panoramic view of the bay, making it the perfect place to relax and sample dishes selected from a richly varied menu. Cuisine: Greek & international, Hours of operation: Breakfast 07:15-10:30 & Dinner 19:00-21:30, Dress Code: Breakfast: Smart Casual, Dinner: Formal to Smart Casual. 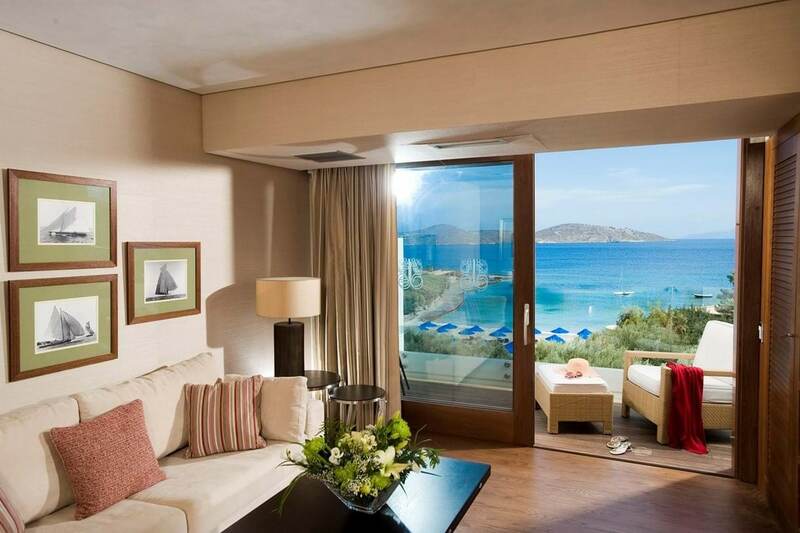 In-room Dining: Elounda Bay Palace offers a fine dining experience within the comfort and convenience of your guest room or suite. Choose from the extensive menu or let our talented chefs cater to your special request. Please contact Food & Beverage department at restaurants@eloundabeach.gr for more information. Blue Lagoon by Mistura: The New Gastronomic concept Mistura, in Elounda Beach Hotel, by the Chref Dimitris Katrivesis is the idea that condenses the essence of Peru. A reflection of their people and the country’s cuisine with a multicultural of Japanese, Spanish, Chinese & Italian influence, blending these marvellous mixtures with its native pre Columbian and Incas gastronomic heritage.Our Mistura is a modern and dynamic restaurant, celebrating the bio diversity of the island, a true homage to the Peruvian multicultural diversity and the Greek culture, by proposing savors that are once familiar yet adventurous and unexpected.Cuisine: Japanese-Peruvian Restaurant, Hours of operation Dinner: 19:30 -23:30, Dress Code: Formal to Smart Casual. Dionysos: Named after the hedonistic God of Wine, Dionysos more than lives up to its promise of indulging all the senses with exquisite cuisine and a legendary wine cellar. 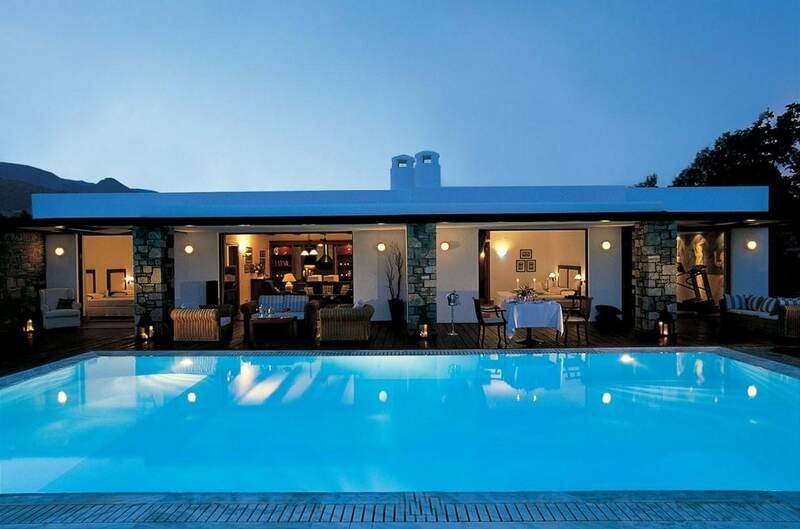 Located at the adjacent Elounda Beach Hotel, this outstanding establishment offers a superb blend of Mediterranean gastronomy with contemporary influences served in an understated, exclusive atmosphere. Cuisine: Fine Dining Mediterranean, Hours of operation Dinner: 19:30 - 23:30, Dress Code: Formal to Smart Casual. Argonaut Seaside Restaurant: Located at the adjacent Elounda Beach Hotel, indulge yourself with the Argonaut’s healthy, enticing Mediterranean snacks during the luncheon hours. Evenings, the seaside restaurant lures you back again with its mouth-watering variety of fragrant Italian dishes, prepared to perfection by our team of Italian chefs. Cuisine: Snack Delicatessen and Italian Restaurant for Dinner, Lunch 12:30-16:30 & Dinner 19:30 -23:30, Dress Code, Lunch: Casual Beachwear, Dinner: Formal to Smart Casual. Kafenion Greek Restaurant: Here you will sample the irresistible and nutritious delights of world-renowned Cretan cuisine. Located at the adjacent Elounda Beach Hotel, pure, simple homemade-style dishes are served in the rustic, laid-back setting of a traditional Greek village square, shaded by olive trees. 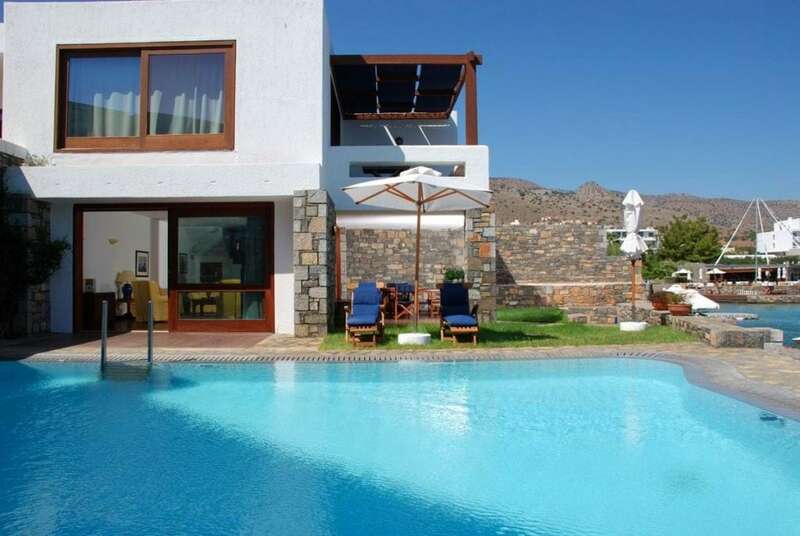 Best of all, the Kafenion is but a stone’s throw from the beach. Cuisine: Traditional Greek, Lunch & Dinner 12:00-23:00, Dress Code: Casual Beachwear - Smart Casual. Hotel with a wide infrastructure is designed for customers who appreciate a high level of service. We recommend for high-quality family holidays. Private Transfers can be organized from and to the airport with Snami premium transfer fleet which includes all the luxury amenities and stylish drivers. Individual Excursions can be tailored based on your desires and expectations with the start point your hotel. Helicopter Transfers & Tours can be arranged by Snami lifestyle representatives to any Greek island and destination accompanied by a premium concierge service. 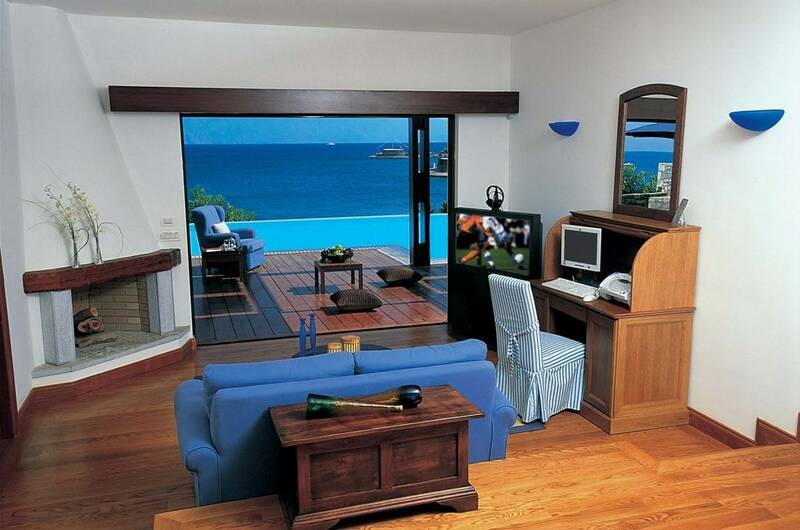 These stylishly furnished and nicely laid-out rooms offer a charming side view of the Cretan waters. They are composed of one bedroom with a twin or Queen sized platform bed, marble-lined bathroom and a private balcony. Upon request, families are provided with connecting accommodation in Side Sea View Rooms. The Classic Bungalows set on the second or third row provide the perfect combination for guests with families that would like to share the pool. It is composed of one bedroom with a concrete platform Queen-size bed and a marble-lined bathroom with a separate shower cabin. 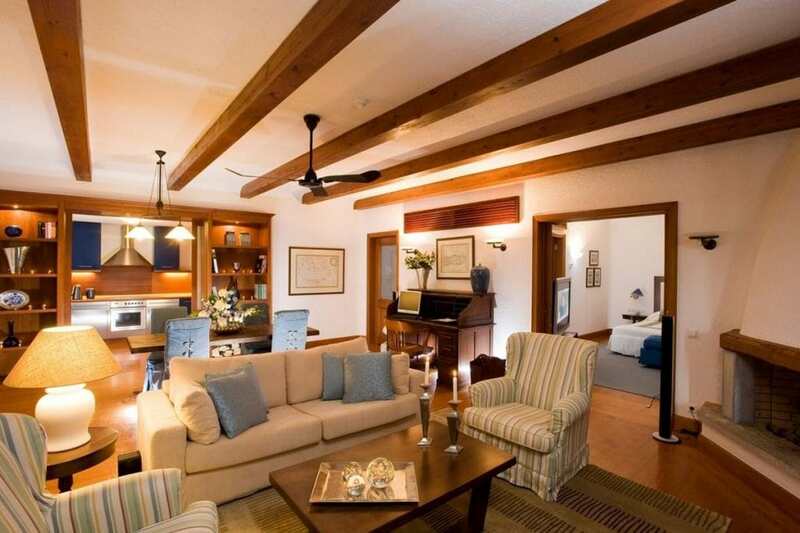 Its spacious private terrace leads to a heatable pool shared with either two or three other bungalows. These bungalows are composed of a bedroom with a Queen-size bed, an open-plan living room designed with a marbled-lined bathroom with a bathtub and some have a separate shower cabin. The superior bungalow accommodation has a veranda with a patio and is located in the picturesque garden area close to the swimming pool. 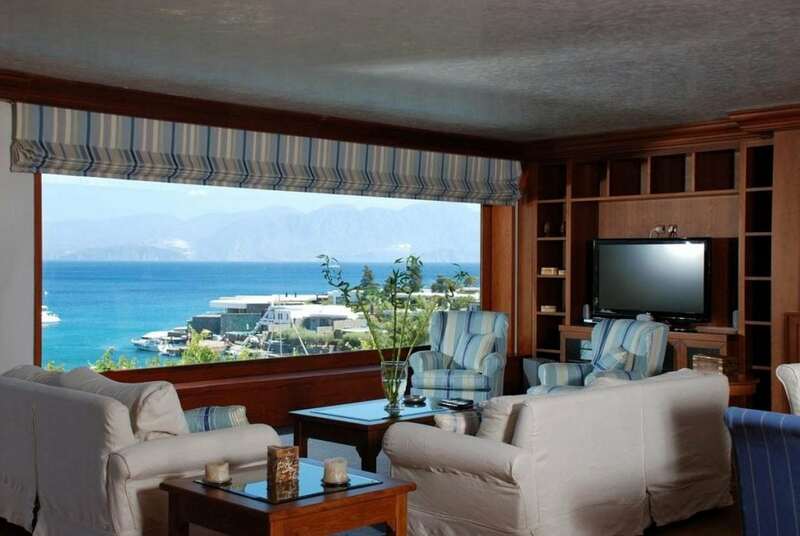 Upon request, families are provided with connecting accommodation in Side Sea View Bungalows. The Deluxe Room has been perceptively designed to provide style and comfort. Offering a sense of panache, these rooms are composed of one bedroom with either Twin or Queen- sized beds, a marble-lined bathroom and a balcony or patio offering a spectacular view to the sea. 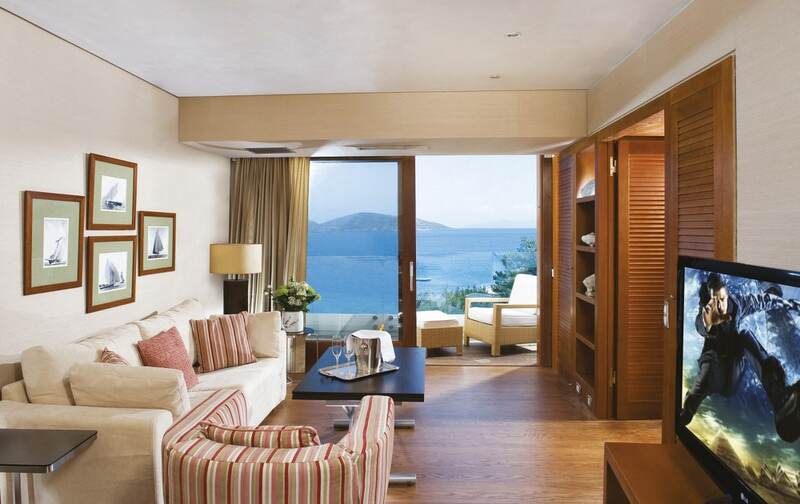 Upon request, families are provided with connecting accommodation in Deluxe Sea View Rooms. This spacious accommodation ideal for families is composed of two bedrooms with either a Queen & twin sized beds, two marble – lined bathrooms with a TV. The comfort of the rooms pours onto an exquisite private balcony which is offering Mountain View. There is also the option of adding a single sofa bed. Designed exclusively to provide the ultimate in personal comfort, these suites provide a perfect equilibrium between luxury and homely familiarity. Set on the first row from the water's edge and offering a panoramic view of the dazzling Mirabello bay, they consist of one bedroom with a queen-size bed, an elegant living room and two marbled-lined bathroom with a Jacuzzi bathtub, TV, separate shower cabin and steam bath, as well as a WC with a shower. The veranda leads directly to a soothing heatable pool, shared with the next-door bungalow. Experience sheer luxury and the joy of sumptuous decor in this stately residence, which is composed of no less than three bedrooms, a lavishly furnished open plan living and dining room area and a fully equipped kitchen to suit your every need. Enjoy the ease and elegance of the three marble-lined bathrooms with a Jacuzzi and steam bath, and the additional guest WC. 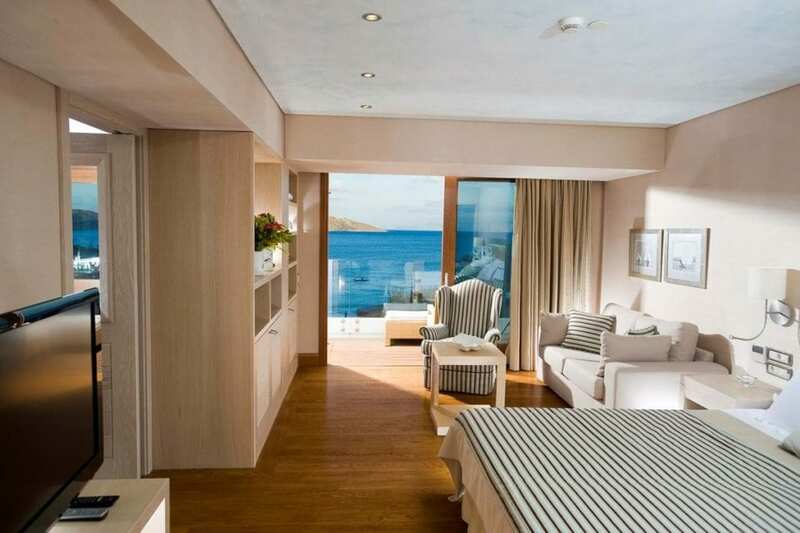 Providing a fantastic level of comfort, the Suite is located on the fourth floor of the main building and offers majestic, sweeping views of Mirabello Bay from its spacious balconies. Decorously living up to its name, the two-floored Presidential Suite is built in the architectural style of a maisonette and stands directly over the water's edge, offering extensive views of Mirabello Bay that can only inspire a deep sense of calm. On the ground floor it is composed of a sumptuously designed living and dining room area, while on the upper floor there is a very spacious bedroom that has been sophisticatedly decorated in soothing Mediterranean tones. On the ground floor, the Presidential Suite includes a separate walk-in dressing room and plush marble-lined bathroom, while on the upper floor you can enjoy a large double vanity marble-lined bathroom with a steam bath and Jacuzzi bathtub. For your hours of private rest and recreation, the Suite has a wooden veranda with a charming private patio with a private heated whirlpool on the ground floor and balcony on the upper floor. 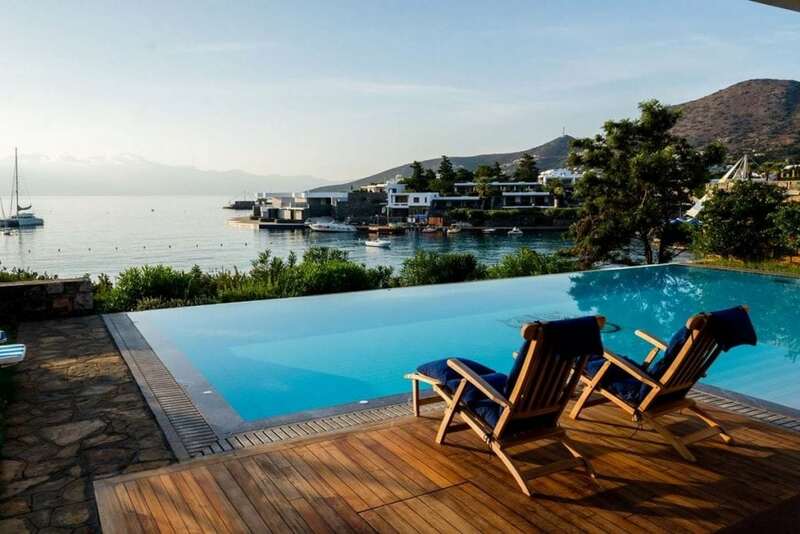 Two splendid villas stand over the water's edge and both of them are yours. This exquisite suite is comprised of two architectural gems, one of which is composed of a bedroom, a spacious separate living room and a bathroom with a Jacuzzi bathtub. The second villa is composed of a bedroom, an open plan living room, a dressing room and a luxurious bathroom with a steam bath and separate shower cabin. Stepping out onto a large veranda from either villa, facing a mesmerizing panoramic view of Mirabello Bay, you will find yourself in a lush garden with a private heated whirlpool designed for your delight. Elounda Bay offers you your own private palace, situated on the second row from the water’s edge and offering majestic panoramic views of Mirabello Bay. This eminent suite is composed of a fabulously lavish living room with a chic dining area, a fully equipped kitchen to suit your every need, two sumptuously comfortable bedrooms, an excellent private gym room and two luxurious marble-lined bathrooms, one of which has a Jacuzzi bathtub, steam bath and shower cabin. The graceful terraces lead to a perfectly soothing private swimmin heated whirlpool and a blossoming private garden, where you can relax profoundly while enjoying the stunning panoramic views of Mirabello Bay.